In The Winter (October - March) we utilise The Ibstock Leisure Complex for Swimming Pool Sessions, Here we offer Rolling Practice, Skills Training and lots of Fun ! We also have many social events planned throughout the year. Click on the Tabs at the top of this page to find out more about us. See 'The Club' tab above for more info about us and for all of our contact details. You can also 'Join Us' there too. After all the years of towing trailers and having to find new paddling locations for each week, we finally have a place to call home ! 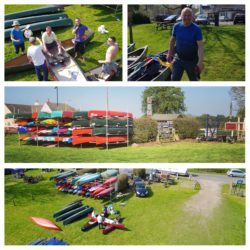 We have Two New Canoe Racks, Two Stoarge Areas & Three Trailers... All of our Kit, Boats & Accessories now reside at The Waterside Inn, Mountsorrel. Use the Map to The Left To Find Us. Use "The Club" Tab and then "Contact Us" To Get In touch !